<<< A kids too dumb to work at newspapers and online news blogs? A new study from psychologists and doctors in Canada found increased screen time in young children can cause issues with children reaching developmental milestones. Researchers studied 2,441 mothers and children with higher levels of screen time for children aged 24 and 36-months-old. Researchers then examined developmental milestone test results in the same children at 36 and 60-months-old. The study found on average, 24-month-old children were watching 17 hours of television per week, 36-month-olds watched 25 hours per week, and 36-month-olds watched 11 hours per week. The totals reflect findings children on average in the U.S. watch to 2 hours and 19 minutes of screen time each day. For each age group, children with increased screen times showed poorer performances on developmental testing when they reached the next age group. Developmental evaluations included communication, gross motor, fine motor, problem solving, and personal-social skills. 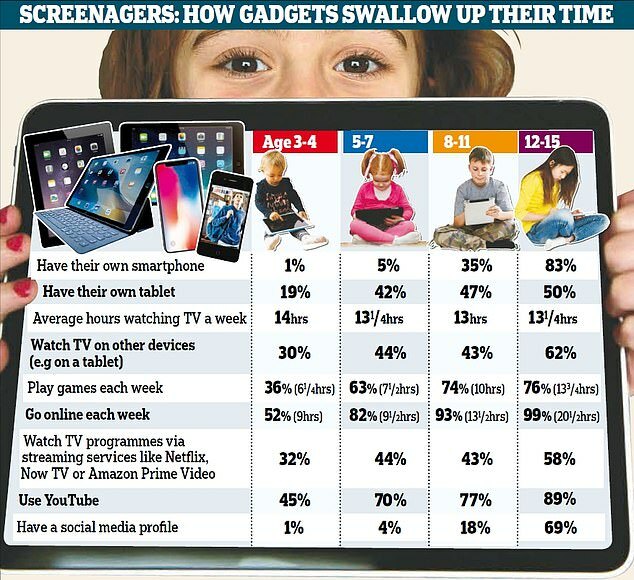 The totals are well above the recommended 1 hour per day of screen time watching high-quality programs. Researchers say about one quarter of children are not developmentally ready for school entry and the trend parallels an increase in screen time use by children. 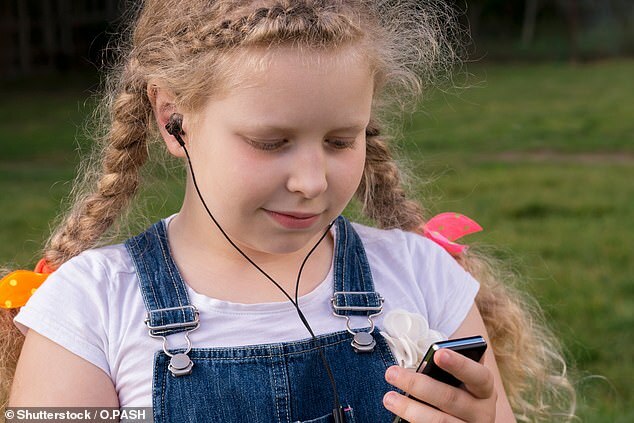 Researchers say the findings indicate pediatricians and parents should provide guidance and have plans in place to create a healthier balance in children's lives and lower the amount of screen time. iPhone FaceTime bug lets callers eavesdrop! I first stumbled upon the existence of this network in November 2014, when I reported for VICE’s Motherboard that US defense secretary Chuck Hagel’s newly announced ‘Defense Innovation Initiative’ was really about building Skynet?—?or something like it, essentially to dominate an emerging era of automated robotic warfare. Except the DoD didn’t bury it. Around 1994, the Highlands Group was founded by O’Neill as an official Pentagon project at the appointment of Bill Clinton’s then defense secretary William Perry?—?who went on to join SAIC’s board of directors after retiring from government in 2003. O’Neill’s claim that there are no reports or recommendations is disingenuous. By his own admission, the secret Pentagon consultations with industry that have taken place through the Highlands Forum since 1994 have been accompanied by regular presentations of academic and policy papers, recordings and notes of meetings, and other forms of documentation that are locked behind a login only accessible by Forum delegates. This violates the spirit, if not the letter, of FACA?—?in a way that is patently intended to circumvent democratic accountability and the rule of law. In her University of Texas article, she attaches the copy of an abstract of the US intelligence community’s MDDS program that had been presented to the “Annual Intelligence Community Symposium” in 1995. The abstract reveals that the primary sponsors of the MDDS programme were three agencies: the NSA, the CIA’s Office of Research & Development, and the intelligence community’s Community Management Staff (CMS) which operates under the Director of Central Intelligence. 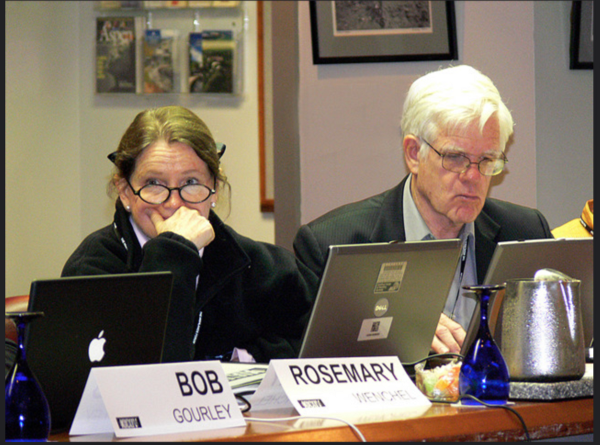 Administrators of the program, which provided funding of around 3–4 million dollars per year for 3–4 years, were identified as Hal Curran (NSA), Robert Kluttz (CMS), Dr. Claudia Pierce (NSA), Dr. Rick Steinheiser (ORD?—?standing for the CIA’s Office of Research and Devepment), and Dr. Thuraisingham herself. However, the bizarre attempt to disassociate Google from the MDDS program misses the mark. Firstly, the MDDS never funded Google, because during the development of the core components of the Google search engine, there was no company incorporated with that name. The grant was instead provided to Stanford University through Prof. Ullman, through whom some MDDS funding was used to support Brin who was co-developing Google at the time. Secondly, Thuraisingham then adds that Brin never “reported” to her or the CIA’s Steinheiser, but admits he “gave presentations to us during our visits to the Department of Computer Science at Stanford during the 1990s.” It is unclear, though, what the distinction is here between reporting, and delivering a detailed presentation?—?either way, Thuraisingham confirms that she and the CIA had taken a keen interest in Brin’s development of Google. Thirdly, Thuraisingham describes the MDDS program as “unclassified,” but this does not contradict its “sensitive” nature. As someone who has worked for decades as an intelligence contractor and advisor, Thuraisingham is surely aware that there are many ways of categorizing intelligence, including ‘sensitive but unclassified.’ A number of former US intelligence officials I spoke to said that the almost total lack of public information on the CIA and NSA’s MDDS initiative suggests that although the progam was not classified, it is likely instead that its contents was considered sensitive, which would explain efforts to minimise transparency about the program and the way it fed back into developing tools for the US intelligence community. Fourthly, and finally, it is important to point out that the MDDS abstract which Thuraisingham includes in her University of Texas document states clearly not only that the Director of Central Intelligence’s CMS, CIA and NSA were the overseers of the MDDS initiative, but that the intended customers of the project were “DoD, IC, and other government organizations”: the Pentagon, the US intelligence community, and other relevant US government agencies. The MDDS programme is actually referenced in several papers co-authored by Brin and Page while at Stanford, specifically highlighting its role in financially sponsoring Brin in the development of Google. In their 1998 paper published in the Bulletin of the IEEE Computer Society Technical Committeee on Data Engineering, they describe the automation of methods to extract information from the web via “Dual Iterative Pattern Relation Extraction,” the development of “a global ranking of Web pages called PageRank,” and the use of PageRank “to develop a novel search engine called Google.” Through an opening footnote, Sergey Brin confirms he was “Partially supported by the Community Management Staff’s Massive Digital Data Systems Program, NSF grant IRI-96–31952”?—?confirming that Brin’s work developing Google was indeed partly-funded by the CIA-NSA-MDDS program. In 1993, when the MDDS program was launched and managed by MITRE Corp. on behalf of the US intelligence community, University of Virginia computer scientist Dr. Anita K. Jones?—?a MITRE trustee?—?landed the job of DARPA director and head of research and engineering across the Pentagon. She had been on the board of MITRE since 1988. From 1987 to 1993, Jones simultaneously served on SAIC’s board of directors. As the new head of DARPA from 1993 to 1997, she also co-chaired the Pentagon’s Highlands Forum during the period of Google’s pre-launch development at Stanford under the MDSS. The Xerox Palo Alto Research Center (PARC) was another contractor among 26 companies (also including SAIC) that received million dollar contracts from DARPA (the specific quantities remained classified) under Poindexter, to push forward the TIA surveillance program in 2002 onwards. The research included “behaviour-based profiling,” “automated detection, identification and tracking” of terrorist activity, among other data-analyzing projects. 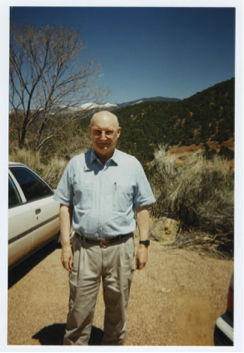 At this time, PARC’s director and chief scientist was John Seely Brown. Both Brown and Poindexter were Pentagon Highlands Forum participants?—?Brown on a regular basis until recently. Long before the appearance of Sergey Brin and Larry Page, Stanford University’s computer science department had a close working relationship with US military intelligence. A letter dated November 5th 1984 from the office of renowned artificial intelligence (AI) expert, Prof Edward Feigenbaum, addressed to Rick Steinheiser, gives the latter directions to Stanford’s Heuristic Programming Project, addressing Steinheiser as a member of the “AI Steering Committee.” A list of attendees at a contractor conference around that time, sponsored by the Pentagon’s Office of Naval Research (ONR), includes Steinheiser as a delegate under the designation “OPNAV Op-115”?—?which refers to the Office of the Chief of Naval Operations’ program on operational readiness, which played a major role in advancing digital systems for the military. As a Stanford PhD student in electrical engineering in the 1980s, Bechtolsheim’s pioneering SUN workstation project had been funded by DARPA and the Stanford computer science department?—?this research was the foundation of Bechtolsheim’s establishment of Sun Microsystems, which he co-founded with William Joy. An email obtained from the Enron Corpus (a database of 600,000 emails acquired by the Federal Energy Regulatory Commission and later released to the public) from Richard O’Neill, inviting Enron executives to participate in the Highlands Forum, shows that Cisco and Granite executives are intimately connected to the Pentagon. 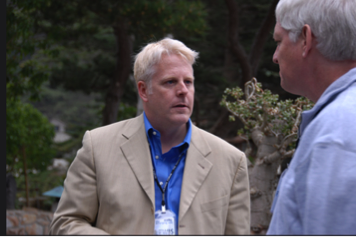 The email reveals that in May 2000, Bechtolsheim’s partner and Sun Microsystems co-founder, William Joy?—?who was then chief scientist and corporate executive officer there?—?had attended the Forum to discuss nanotechnology and molecular computing. Then a year after, in 2011, another of O’Neill’s Google Plus connections, Michele Quaid?—?who had served in executive positions at the NGA, National Reconnaissance Office and the Office of the Director of National Intelligence?—?left her government role to become Google ‘innovation evangelist’ and the point-person for seeking government contracts. 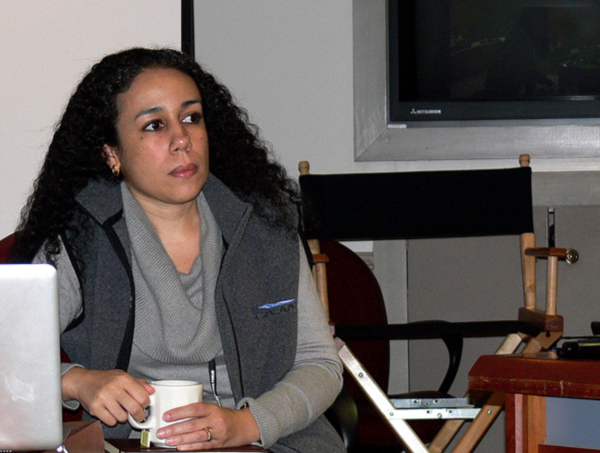 Quaid’s last role before her move to Google was as a senior representative of the Director of National Intelligence to the Intelligence, Surveillance, and Reconnaissance Task Force, and a senior advisor to the undersecretary of defense for intelligence’s director of Joint and Coalition Warfighter Support (J&CWS). Both roles involved information operations at their core. 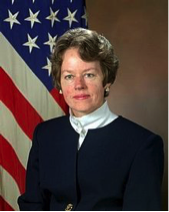 Before her Google move, in other words, Quaid worked closely with the Office of the Undersecretary of Defense for Intelligence, to which the Pentagon’s Highlands Forum is subordinate. Quaid has herself attended the Forum, though precisely when and how often I could not confirm. 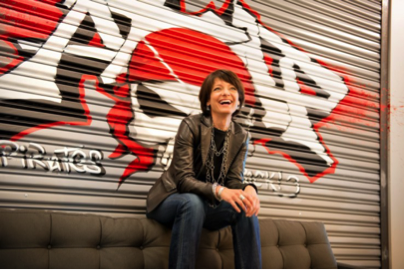 In March 2012, then DARPA director Regina Dugan?—?who in that capacity was also co-chair of the Pentagon Highlands Forum?—?followed her colleague Quaid into Google to lead the company’s new Advanced Technology and Projects Group. During her Pentagon tenure, Dugan led on strategic cyber security and social media, among other initiatives. She was responsible for focusing “an increasing portion” of DARPA’s work “on the investigation of offensive capabilities to address military-specific needs,” securing $500 million of government funding for DARPA cyber research from 2012 to 2017. We now know that just two months before O’Neill’s address at Harvard in 2001, under the TIA program, President Bush had secretly authorized the NSA’s domestic surveillance of Americans without court-approved warrants, in what appears to have been an illegal modification of the ThinThread data-mining project?—?as later exposed by NSA whistleblowers William Binney and Thomas Drake. Gilman Louie is a former CEO of In-Q-Tel?—?the CIA firm investing especially in start-ups developing data mining technology. In-Q-Tel was founded in 1999 by the CIA’s Directorate of Science and Technology, under which the Office of Research and Development (ORD)?—?which was part of the Google-funding MDSS program?—?had operated. The idea was to essentially replace the functions once performed by the ORD, by mobilizing the private sector to develop information technology solutions for the entire intelligence community. Louie had led In-Q-Tel from 1999 until January 2006?—?including when Google bought Keyhole, the In-Q-Tel-funded satellite mapping software. 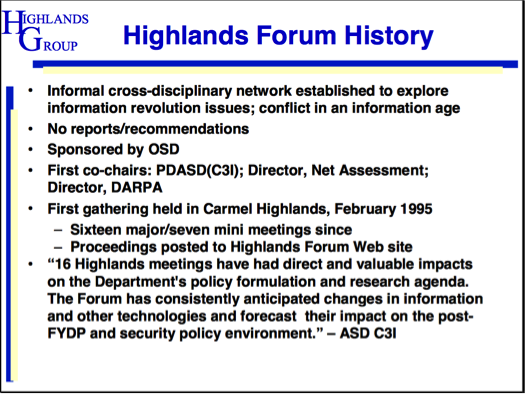 Among his colleagues on In-Q-Tel’s board in this period were former DARPA director and Highlands Forum co-chair Anita Jones (who is still there), as well as founding board member William Perry: the man who had appointed O’Neill to set-up the Highlands Forum in the first place. 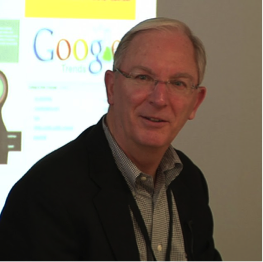 Joining Perry as a founding In-Q-Tel board member was John Seely Brown, then chief scientist at Xerox Corp and director of its Palo Alto Research Center (PARC) from 1990 to 2002, who is also a long-time senior Highlands Forum member since inception. We also now know thanks to Snowden that the NSA’s XKeyscore ‘Digital Network Intelligence’ exploitation system was designed to allow analysts to search not just Internet databases like emails, online chats and browsing history, but also telephone services, mobile phone audio, financial transactions and global air transport communications?—?essentially the entire global telecommunications grid. Highlands Forum partner SAIC played a key role, among other contractors, in producing and administering the NSA’s XKeyscore, and was recently implicated in NSA hacking of the privacy network Tor. As Wells is no longer in government, this is to be expected?—?but he is still connected to Highlands. 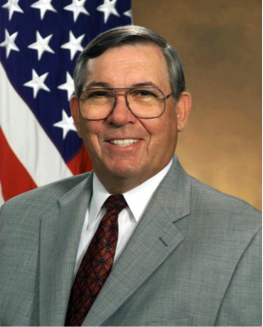 As of September 2014, after delivering his influential white paper on Pentagon transformation, he joined the Monterey Institute for International Studies (MIIS) Cyber Security Initiative (CySec) as a distinguished senior fellow. In 2001, Bush appointed Stephen Friedman to the President’s Intelligence Advisory Board, and then to chair that board from 2005 to 2009. Friedman previously served alongside Paul Wolfowitz and others on the 1995–6 presidential commission of inquiry into US intelligence capabilities, and in 1996 on the Jeremiah Panel that produced a report to the Director of the National Reconnaisance Office (NRO)?—?one of the surveillance agencies plugged into the Highlands Forum. Friedman was on the Jeremiah Panel with Martin Faga, then senior vice president and general manager of MITRE Corp’s Center for Integrated Intelligence Systems?—?where Thuraisingham, who managed the CIA-NSA-MDDS program that inspired DARPA counter-terrorist data-mining, was also a lead engineer. In the footnotes to a chapter for the book, Cyberspace and National Security (Georgetown University Press), SAIC/Leidos executive Jeff Cooper reveals that another Goldman Sachs senior partner Philip J. Venables?—?who as chief information risk officer leads the firm’s programs on information security?—?delivered a Highlands Forum presentation in 2008 at what was called an ‘Enrichment Session on Deterrence.’ Cooper’s chapter draws on Venables’ presentation at Highlands “with permission.” In 2010, Venables participated with his then boss Friedman at an Aspen Institute meeting on the world economy. For the last few years, Venables has also sat on various NSA cybersecurity award review boards. Dr Lochard maintains a comprehensive database of 1,700 non-state groups including “insurgents, militias, terrorists, complex criminal organizations, organized gangs, malicious cyber actors and strategic non-violent actors,” to analyze their “organizational patterns, areas of cooperation, strategies and tactics.” Notice, here, the mention of “strategic non-violent actors”?—?which perhaps covers NGOs and other groups or organizations engaged in social political activity or campaigning, judging by the focus of other DoD research programs.